Virtualization has become a standard in most IT environments, however, a lot of storage solutions have not evolved as quickly as they have needed to in order maximize virtual environments. 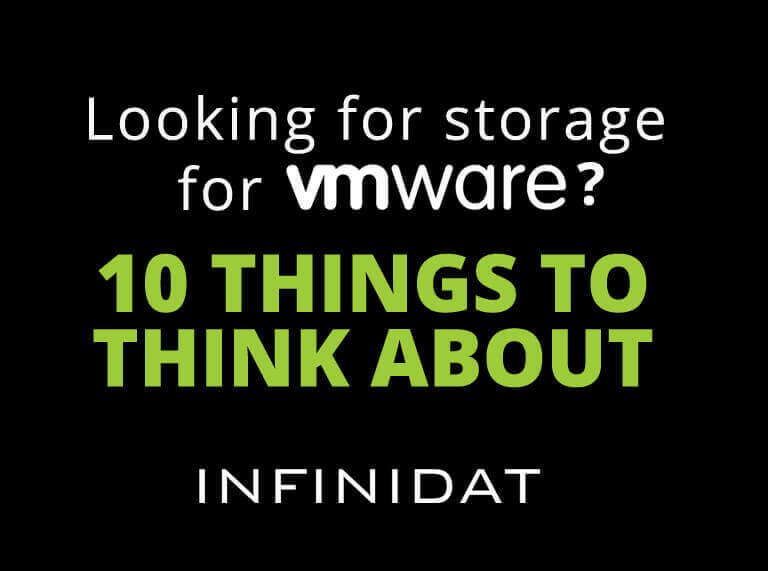 As a result, choosing the right storage behind your VMware environment is paramount. Following are ten key areas that you need to evaluate in order to have a virtualized infrastructure that delivers the performance and availability your business requires. Simplicity — Look for a solution that eliminates the need for tuning or optimization from VMware and administrator perspectives. The solution should be able to automate the difficult tasks of data placement, policy making, performance and reliability, and put an end to time spent deciding what type of RAID groups, size of RAID groups, pools or extents are optimal for any given workload. The right solution can take care of all of this for you, making the management of your virtual environment much more simple. VMware Integration — Ideally, your storage solution will offer VMware Ready certified integration with VMware APIs, including VAAI, VASA, SRM and vVols. The integration should facilitate quick and consistent set up in a matter of minutes. Additionally, make sure that provisioning and data protection tasks such as single VM backups and restores, can be done very quickly and with minimal effort and training. Ease of Management — Your storage solution should enable instant provisioning to save configuration time, and ensure optimal and consistent performance. It should also support multi-tenancy, allowing users to manage their entire virtualized capacity, on their own through vCenter. Your solution should also allow administrators to easily validate server configurations, configure, provision, and manage storage — all from the same vCenter interface. Single-Instance VM Backup and Restore — Simple, single-instance backup and restore is essential for your virtualized environment. Make sure your storage solution can fully automate your entire data protection process and maintain consistent copies of thousands of VMs with relatively small retention schedules. Application Performance — Endless VM sprawl may lead to a growing number of storage arrays creating storage silos and having a profound effect on performance. Avoid this with a solution that can scale to support the performance needs of your entire virtualized environment. Today’s storage solution should be designed to serve tens of thousands of VMs and leverage intelligent information placement and massive caching, just like those architectures found in big data and analytics platforms that speed the flow of information. Reliability — Uptime is critical to keep the business running properly. A solution designed to perform at 99.99999% (seven nines) availability maximizes your productivity and helps the business to be more competitive. Additionally, next generation storage that takes advantage of a self-healing architecture — maximizes business success. Green — Virtualizing your server environment helps in consuming less power and cooling, however, when you virtualize, you consume, on average, four times as much storage so the savings you gained on the server side are quickly lost with your storage. A storage solution that minimizes environmental impact and carbon footprint during both the manufacturing process, and operational runtime can save your company a great deal of money and help to drive a better TCO when it comes to your overall storage budget. Capacity Efficiency — A storage solution that offers high useable capacity utilization out of the drives in the system with no hotspots, without sacrificing availability provides good storage efficiency and lower costs. In addition, the system should support all VAAI APIs including the thin reclamation API. Ideally, the storage solution you select will have the ability to reclaim zero capacity in real time. For VMware, maximizing capacity automatically and without user intervention will be essential. In the end, high capacity efficiency is reflected in a lower TCO (total cost of ownership). Consolidation and Scale — Capacity and performance in a virtualized environment must be flexible, non-intrusive and demand no human intervention. The ideal storage solution for your VMware environment should enable you to consolidate multiple traditional storage frames into a single frame, with less power consumption and without limitations on capacity or performance. Service and Support — Ensuring the success of your organization is about more than purchasing the right enterprise storage platform, it is about having the right backing to ensure success throughout the lifecycle of the platform. Service and support are imperative. The vendor you choose needs to ensure non-stop operation and readily support upgrades and migrations. Don’t underestimate the value of working with a vendor that provides a dedicated resource to support your investment in their storage solution. Storage integration for VMware is complex. There has to be a good balance of features, functions, reliability, ease of use, integration, performance and, of course, cost. The InfiniBox enterprise-proven storage array was designed to achieve this balance and leads the industry in advanced VMware storage integration. Learn more about VMware storage integration here.